There are two things to know about hospitality in Iran: First, the word mehmooni means “party” in Persian. Second, a mehmooni is the fastest way to end up in a hospital or gain 30 pounds. During my five-month stay in Isfahan, I had to endure many a mehmooni, and towards the end of my trip, the sole mention of the word would make me crave a whole bottle of omeprazole. But that had nothing to do with the quality of the food, the way it’s cooked, or its spices. That culprit was t’aarof. T’aarof is a Persian cultural practice of excessive courtesy or hospitality, which applies to all aspects of life in Iran. For example, if a customer takes a cab or goes shopping, the driver or storeowner will do t’aarof by saying ghabele nadare—”it has no value”—when the customer asks for a price. The customer then should say something nice in response, and continue to insist on paying until they are, at long last, given a price. This made me come up with a set of rules for surviving the mehmoonis—a guide to getting around the t’aarof, and avoid over-eating against my will to the point of sickness. I’m definitely not recommending that you starve yourself—I am a dietician, after all—but sometimes extreme measures are needed when you find yourself coerced into consuming a small mountain of food. 1. Pretend you’re already sick The peak mehmooni season is right after Nowruz, the Persian New Year. For the first 13 days after the New Year, you’re expected to visit all of your relatives, and all of those same relatives come to visit you. One day in particular, I went to three different mehmoonis, at all of which I was expected to eat as if I had been on a juice fast for a week. On the thirteenth day, I feigned a stomach ache to avoid ending up with a real one. Throw in some fake headaches, nausea, or diarrhea for good measure. 2. Never assume there won’t be more food later Your generous hosts have seated you in front of a coffee table with a plate full of fruits and a bowl of ajil, a mix of pistachios, almonds, cashews, hazelnuts, different seeds, and raisins. They’ve offered you gaz, sohan, sweets, cakes, and chai. They’ve served you sharbat, a sweet drink made out of watered-down fruit syrup. They’re watching your plate, and encouraging you to try everything. You decide to indulge, and eat a banana, a peach, some figs, and a bunch of pistachios, hazelnuts and raisins. The chai is delicious, especially when accompanied by the sweet gaz and sohan. You drink the refreshing sharbat last. Now you’re stuffed, but it has all been delicious. Then, they call everyone to the dining room: “Dinner has been served.” Dinner? Yes. Time to really eat. 4. Eat small, slow, and leave some waste If you’re not good at lying, you can stick to eating the small foods that take a long time to eat and leave visible waste behind. Seeds and pistachios are usually served in their shell. By eating them, your hosts will see a constant hand-to-mouth motion on your side, and you will also rack up tons of tiny shells on the scraps plate in front of you, making it look like you’ve eaten a lot. If you decide to go with fruit, eat the ones with the inedible skin, such as oranges, bananas, and kiwis, and place all the skin on the scraps plate. Almonds and hazelnuts aren’t usually served in their shells, so eating them doesn’t leave behind any evidence of consumption. Neither do cakes, raisins, or sohan, a saffron-flavored toffee. Some gaz—a kind of nougat—come with a paper wrapping, so chewing half of it and placing the paper on the scraps plate will look good, too. That’s the paradox of mehmooni eating: If your hosts see a clean scraps plate in front of you, they will assume you didn’t eat anything, and will insist on feeding you even more. If you eat everything they offer, they will assume you’re hungry and will come around with some more. Scraps are the only way out of this endless loop. 5. Play with your food Unless you’re on very good terms with your hosts, this may not be considered polite, and only works well if there are small children that need to be entertained. At one mehmooni, after getting tired of the constant t’aarof coming my way and with no more space in my stomach, I started making human figures out of fruits and nuts. Two little nieces signed up as my helpers, which made it look more like child play than food waste. I wasn’t offered any more food. 6. Don’t eat beforehand If I had a mehmooni the following afternoon or evening, I’d eat a light breakfast and lunch, and then nothing else until it was time to attend the party. For late night events, I’d sip on chai with rock sugar after lunch to keep my energy up. Know that if your mehmooni starts at 10 PM, they will likely serve food, and lots of it, around midnight—after you’ve eaten all those fruits, nuts, seeds, sweets, and chai. What you call a midnight snack, they call dinner. 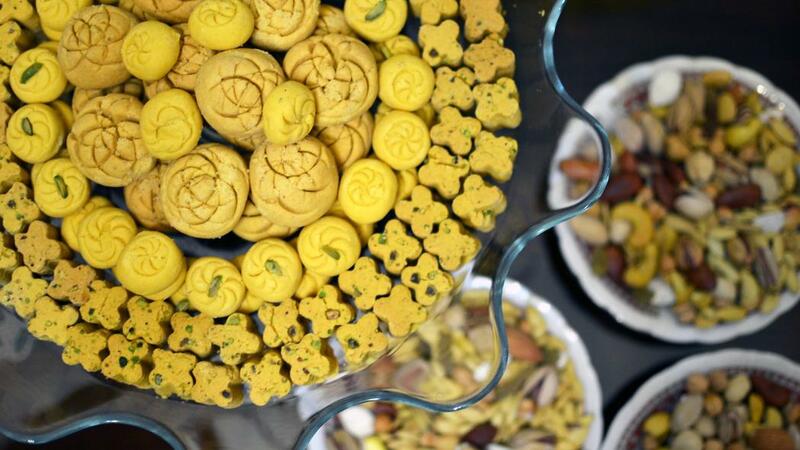 Also, remember that more chai and sweets will be served after dinner, so you need to save some space for that too. As frustrating and potentially life-threatening as it can be sometimes, however, Persian hospitality is a beautiful thing. The notion that your guest must always be offered the best, and all the efforts and planning that go into hosting a mehmooni, are not lost on me. Some of these rules not only helped me maintain my weight, but also allowed me to try a bit of everything I was offered without getting sick, or seeming rude to my hosts. I got the best out of the mehmoonis, but they didn’t get the best of me. The Top 5 Iranian Food Instagram Accounts That Makes You Think To Cook Iranian Food Tonight!